Grand Theft Auto has always been my favorite franchise ever since I got my hands on GTA II. I heard that in later games, you could not only steal cars but also get helicopters and that thought of stealing and piloting a helicopter pretty much stunned me. Today, almost a decade later, I’ve played GTA Vice City and GTA San Andreas. I’ve spent countless hours on these two games letting my criminal mind live on the virtual world. I stole exotic cars. I unloaded missiles on cars creating mayhem. I spent hours just seeing how far I can survive in the middle of a road with top wanted level with the help of cheat codes. Turns out, I could go on forever. Anyway, ever since GTA IV came out, I’ve been so eager to play this. But I never really got to play this. First that’s because I never had a compatible system that could play GTA IV. When I did get a laptop that can play GTA IV in medium settings, I failed to find a crack that worked. The internet is flooded with problems related to GTA IV on PC. GTA IV not playing on Windows 7/8; GTA IV freezing on character loading screen; GTA IV not letting players change the graphics settings and so on. I faced each one of these errors and I finally gave up hoping that I’d get a real license from Steam. Fortunately, I managed to get GTA IV Complete Pack with Episodes from Liberty City during Steam Summer Sale a couple weeks ago. I thought all my nightmares were finally over. Little did I know that paying for games does not necessarily get us away from having issues. 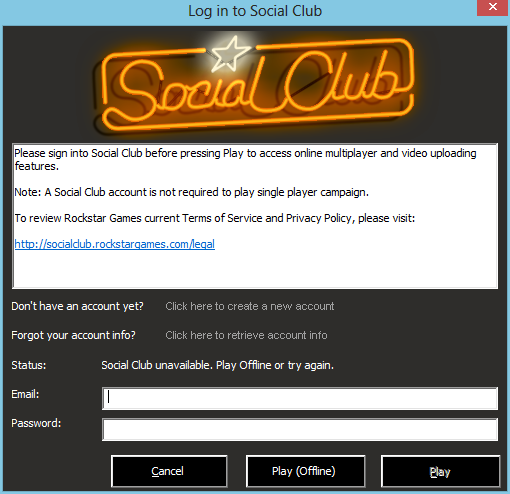 I’m still unable to log in to Rockstar Social Club, therefore unable to play multiplayer. But I don’t do multiplayer gaming anyway, so this isn’t an issue to me. Especially compared to not being able to play at all. First I couldn’t launch the game. When I could, I faced issues with graphics settings. Upon fixing that, I faced character loading screen freeze issue. And finally I was able to fix that too. Now my game plays just like the way I wanted it to. I’m playing this, with some very unnoticeable lags, on a laptop with Intel HD 4000. If you’re following this, please launch the game at the end of every step to make sure you’ve resolved the relevant issue. I kept facing this error. Clicking the second button did nothing until I applied these fixes below. After the game finished installing, I couldn’t play it. Every time I hit the play button, I was greeted with the Rockstar Social Club window with the connectivity error message. The only option available was to play offline, which was okay with me. But clicking the button did no good to me. So some time on the web yielded me the following troubleshoot which worked. Extract the content of this compressed file using WinZip, WinRAR, or 7zip. Go to GTA IV folder. It’s usually on Steam -> SteamApps -> common -> Grand Theft Auto IV -> GTAIV folder. Note that by default the Steam folder may be located under C:\Program Files (x86). But if you chose a different drive/folder to place the GTA IV game on, it will be on that folder. Now, paste all the content of the compressed file (src folder and two dll files) into the GTAIV game folder. 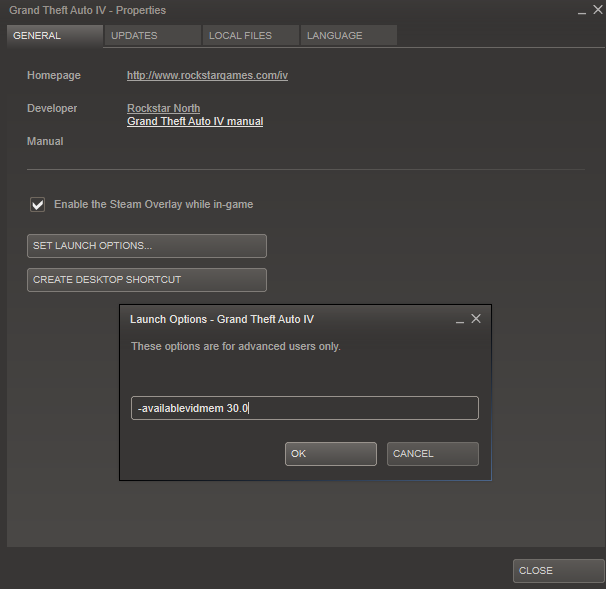 An extra step: Right click on GTA IV application file and open properties. Set compatibility to Windows Vista Service Pack 1. I didn’t need to do this, but some computers might require you to do it. Now, try to run the game from Steam library. You should be able to play it even if you had to click Play offline button from Rockstar Social Club. To my utmost disappointment, I realized that I was stuck at 800 x something resolution. It sucked. I knew I had only Intel HD 4000, but I knew it could do better. I knew right away that there were some way to get around it. And after a little research, I found the much-loved commandline.txt method. 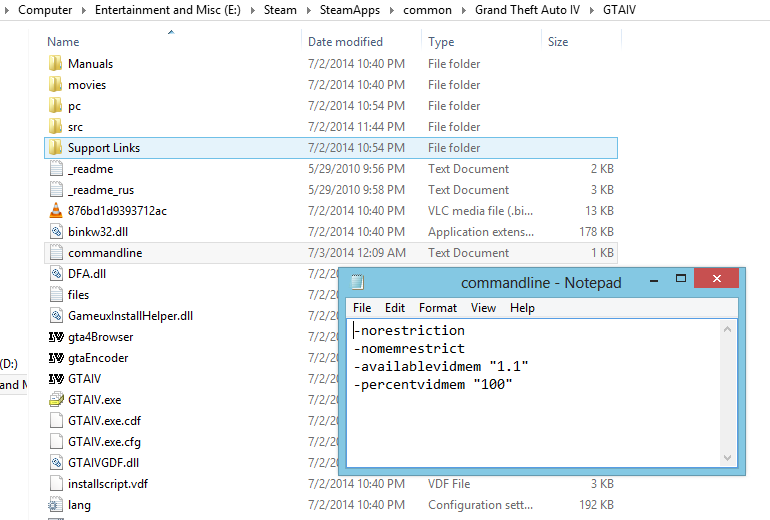 Commandline.txt is a custom file that you need to create in order to bypass the video memory restriction that Rockstar puts into GTA IV games. Doing so is very simple. Just go to the game folder (I already told you where it was in the previous step) and create a new text file. Name it commandline.txt (You might not have to type in the .txt part as it will be automatically added). Now, open the commandline.txt file, and copy-paste the following lines. Save the file on the game folder. Triple check that the name of the file is commandline.txt before launching the game again. In my case, I was immediately able to up my graphics resolution to 720p. But I chose 1024×768 pixels resolution because I knew that’d be the best settings to play the game in my system. Make sure your screen looks exactly like my screenshot. As I was feeling like a boss being able to reconfigure the graphics settings, I figured out shortly that there was another problem: the loading screen with characters popping up was frozen. I had faced similar issue on a pirated version. I thought that was because, well, the game was illegitimate. Frustrated, I set out to find the perfect solution to fix that problem, and I found one rather quickly. I’ll get straight down to business. First, you need to figure out the available dedicated memory in your computer. To find that out, right click on your desktop and click Screen Resolution. Click Advanced settings on the lower right of the window. It will pop-up another window where you will be able to see the dedicated video memory of your system. In my case, it was 32 MB. Keep a note of it. Please note that you need to replace the 30.0 with whatever dedicated video memory you have. Don’t go beyond what you have, don’t even put exactly what you have. Put a number slightly below it. As you can see in my case, I have 32 MB, so I put in 30. The decimal is required for some reason, so you have to put in 30.0 instead of just 30. If your dedicated video memory is same as mine, you’ll be okay just copy-pasting the above-mentioned text into that Set Launch Option box. Click OK to come back out. You sure you got that right? Now play the game. In my case, that Rockstar Social Club window came back up with the same unavailable message, but this time I got it to play at my selected graphics resolution and the character loading screen no longer froze. I finally broke free of all the technical difficulties to playing GTA IV on my computer. It sucked that I had to go through all that trouble despite buying the game in a legitimate way, and I can only imagine how non-savvy people would feel if they were to do all this. But if you faced a similar issue like me, I hope you got it to working by following the fix I’ve provided here. Just to be clear, I found these fixes on the web and I’m writing this post for future reference of myself. If anyone else, like yourself, can be helped following this, please do let me know in the comments. Your feedback will be much appreciated. Prev Music Video: What my idle search for GTFO yielded made my day!